The research question I set out to explore was: Does visualizing the cues & patterns present in social archives help users understand the spaces they inhabit and the relationships they maintain online? The Internet has fostered environments that support social interaction at an unprecedented scale. Hundreds, thousands of people come together in online public spaces to exchange ideas, ask questions, and comment on daily life events. A single person can easily stay in touch with several hundred people all over the globe over email. These public and private exchanges leave behind massive amounts of persistent traces that are highly representative of the relationships that people maintain. Yet, these traces are mainly invisible and unusable to users today. In a sense, this thesis is about making the invisible visible. As mediated communication becomes an increasingly central part of everyday life, people have started going online to conduct business, to get emotional support, to find communities of interest, and to look for potential romantic partners. Most of these social activities take place primarily through the exchange of conversational texts that, over time, accrue into vast archives. As valuable as these collections of documents may be for our comprehension of the online social world, they are usually cumbersome, impenetrable records of the past. 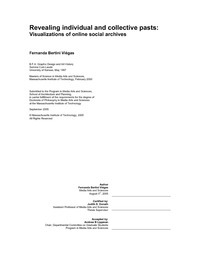 This thesis posits that history visualization - the visualization of people's past presence and activities in mediated environments - helps users make better sense of the online social spaces they inhabit and the relationships they maintain. Here, a progressive series of experimental visualizations explores different ways in which history may enhance social legibility. The projects visualize the history of people's activities in four different environments: a graphical chat room, a wiki site, Usenet newsgroups, and email. History and the persistent nature of online communication are the common threads connecting these projects. Evaluation of these tools shows that history visualizations can be utilized in a variety of ways, ranging from aids for quicker impression formation and mirrors for self-reflection, to catalysts for storytelling and artifacts for posterity. Beat war Co-Leiter des ICT-Kompetenzzentrums TOP während er Diese Doktorarbeit ins Biblionetz aufgenommen hat. Die bisher letzte Bearbeitung erfolgte während seiner Zeit am Institut für Medien und Schule. Beat besitzt kein physisches, aber ein digitales Exemplar. Eine digitale Version ist auf dem Internet verfügbar (s.o.). Es gibt bisher nur wenige Objekte im Biblionetz, die dieses Werk zitieren. Beat hat Diese Doktorarbeit auch schon in Blogpostings erwähnt.